Sand washing machine is mainly through the stirring of impeller and water to realize washing and cleaning functions to get clean sand an gravels. LZZG sand washing machines are widely used by customers from all over the world to solve sand processing problems they are facing. Sand washing machine adopts advanced technology and is combined with the actual situation of sand and gravel industry in domestic and foreign. It has the features of high degree of cleaning, reasonably structure, large process capacity, less sand loss in sand washing process, especially its bearing device of impeller is separated from water and materials in water. So the fault rate is much lower than others.In conclusion, sand washing is the best choice for the sand -making industry. 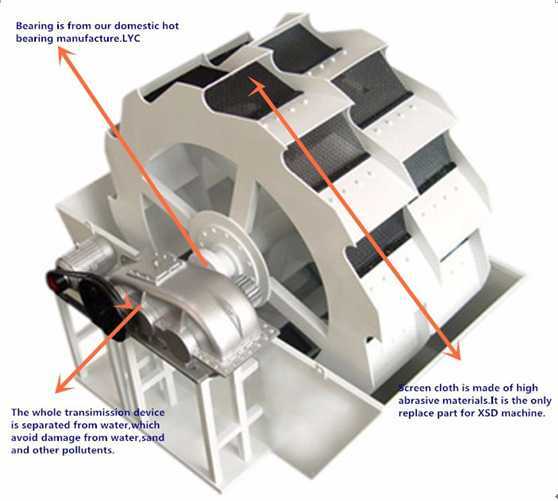 (1) Reasonably structured: The bearing device of impeller is separated from water and materials in water, which greatly protects the bearing from soaking, sand and pollutants.